I'm a triathlete and personal trainer. I've seen in recent years how sport technology has developed in ways that were barely imaginable a decade ago. A lot of that recent development has been in tech aimed at getting people off the couch and into fitness. Well, this feature is not about those gadgets. When keen athletes analyse their performances and look for those “marginal gains” to improve personal bests – or because we're simply interested in numbers – tech also plays a huge role nowadays. As a result the gadgets that are shortlisted here won't only get you fit but really, really fit. But not from a standing start. After something a little more gentle? As you probably know, the Supercompensation theory was first theorised back in 1949-1959 by the Russian scientist Nikolai N. Yakovlev (1911-1992). Its main principle is simple, but potentially crucial for sports, particularly activities focussed around endurance. The supercompensation period is that time frame after training when the body recovers, adapts and has time to get fitter. Long story short: to become fitter, stronger, faster, you also need to rest for a certain amount of time. Not too much, otherwise you’ll lose fitness; not too little or you risk overtraining. SuperOp helps you to be spot-on with your recovery time and helps you optimise your supercompensation period. The way it works is easy. In the morning, before getting out of bed, measure your heart rate and blood pressure with a wrist meter. Second, connect the results to the SuperOp app. Now you will get an index of metabolic readiness from 0 to 100. This will tell you the ideal workload that your body is able to assimilate in order to optimise your supercompensation on that particular day. It sounds like rocket science, but this device is actually really easy to use and after having tested it for more than a year I can say it is also very reliable. Pro cycling teams use it too. Okay, PainPod sounds like something Ming the Merciless might employ in his interrogation chamber, but this is accidentally intended to prevent discomfort, not cause it. On top of knowing how much workload you should put in on a specific day, it is also important to prevent, or cure pain and injuries when they occur. The use of electro stimulation for pain relief in sport (and elsewhere) has been around for a long time now, with Compex being one of the pioneers in the field. The idea is again simple and smart: muscles are normally moved and activated by neurons and electric inputs. PainPod effectively replacing your nervous system whilst in use, inducing muscle stimulation to achieve specific goals and targets around reducing pain and speeding recovery from injuries. This offers 12 specific treatments and 20 intensity settings. A manual is thankfully provided to guide you on how to place the pods on your muscles properly – it's not an intuitive process but you'll soon get the hang of it. Measuring the body fat percentage of an individual can be hard with normal tools like a body monitor scale or body fat calipers. The issue is that the first is just a reasonable estimate, and the latter relies on having a lot of experience of 'clipping fat'. The optimum results are the ones you get in a lab, but that's not entirely practical. Skulpt, however, claims to have added an extra option. Press its Muscle Scanner to 24 areas of the body and it gives not only a read of your fat percentage but also the “quality" of your muscles (how lean and strong they are, basically). There are, shall we say, "different schools of thought" around this product, but some swear by it. What's undeniable is that it's an easy-to-use and pain-free gauge that won't cause the bruises that calipers plus inexperience can bring. The first time I saw a pair of these, I thought they looked like Darth Vader's trousers. Then I found out they were shorts and not trousers, and my inspiration was partly gone. Only partly, though, because the Myontec still pulls me in like the dark side of the force. The goal of Myontec shorts is setting the right intensity and training load according to your specific targets and phase of training (warm up, main, or cool down). It’s a similar concept to working out with a heart rate monitor but for other muscles, mainly quads and hamstrings. 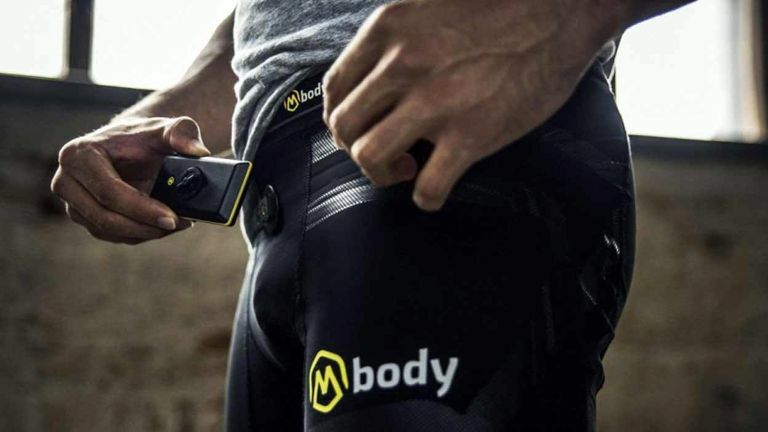 To this end, Myontec's techy pantaloons claim to measure the electrical activity of your muscles – as mentioned above, all our muscles are activated by electrical signals coming from our nervous system. Hence, your shorts can give you real-time feedback on the intensity you’re training at and the actual muscle load. The system also compares these numbers with other data, including heart rate. An integrated pod transmits live feedback on its findings to your iOS or Android phone via Bluetooth. May smart training be with you. + Finally, no pods or torque wrench required! For long time, Garmin had a pretty annoying version of these pedals. It worked with extra pods you needed to place on your cranks. These were rather fragile, and had to be tightened with a torque wrench to a specific gauge. The latest version of the Vector finally works without any of these annoying extra caveats. If you’re a cyclist or a triathlete, there is no better way to train your cycling-related fitness than using a power meter. In order to have the best results, though, you will always need to use it in conjunction with a heart rate monitor and your own Rate of Perceived Exertion (RPE). However, the insight and feedback of working out at specific power zones – measured in the watts propelled to your pedals – means it's the number one tool you can use to improve your thresholds. How about a bike to attach your Vector 3 to? How many times have you heard of the benefits from training at high altitude? Pro cycling teams and runners alike spend part of their year in the mountains in order to boost their physiological parameters "naturally" and some high-end gyms (Virgin Active in Mansion House, London for instance - they also have GymJKit-compatible cardio machines there) have sealed rooms that simulate altitude by reducing the barometric pressure of oxygen in the atmosphere, so your cardiovascular system has to work harder to use it. But there is no need to travel if you have a Hypoxico Altitude Training Tent; you can have the same benefit simply by sleeping in one, with less oxygen, at home. There are different sizes and prices to fit all wallets, from a 'head tent' to the king-sized one pictured here, which has room to house your other half, for a romantic night of fitness-boosting (safe) oxygen deprivation.